Section of the Mail Service. The Rogueport Direct Mail Service (also known by the abbreviation RDM) is a magazine-like e-mail service published in Rogueport and distributed by the Rogueport Restoration Committee. Professor Frankly subscribed Mario to RDM during the events of Paper Mario: The Thousand-Year Door, and he receives issues of the service in his Mailbox SP, usually after beating a chapter. 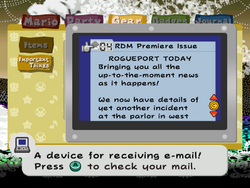 The main body of an issue of RDM is all about various newsworthy things, from gossip (such as the relationship between Zess T. and Toadsworth) to local news (such as Goomfrey beating up the Pianta Exchanger in the Pianta Parlor, who later commented that it didn't feel any pain). The next part of an issue is "Shop Reporter Go! ", which showcases a shop from the game (usually from the preceding chapter) and its owner. Often, the player will be rewarded with double shop points when buying at the shop that is showcased. The offer only lasts for fifteen minutes within receiving the e-mail. The issue is concluded with "Cooking for Rookies", which showcases various recipes that can be made by Zess T., if the right ingredients are brought to her. After this, there is an Editor's Note, usually promising a good next issue, and a note that the issue was published by the Rogueport Restoration Committee. Mario receives eight emails during the events of Paper Mario: The Thousand-Year Door. The first is a registration verification email and the rest are regular issues. A bonus "hidden" section in the final email was removed from the English version. This page was last edited on November 21, 2018, at 05:41.